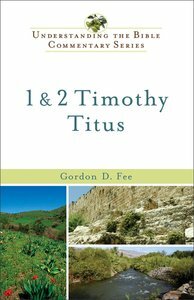 About "1 and 2 Timothy, Titus (Understanding The Bible Commentary Series)"
Gordon D. Fee (Ph.D., University of Southern California) is Emeritus Professor of New Testament at Regent College, Vancouver, Canada specializing in New Testament criticism. He has authored commentaries on 1 Corinthians; 1 and 2 Thessalonians (NICNT), Philippians (IVPNTC/ NICNT); Galatians (The Pentecostal Commentary); Revelation (New Covenant Commentary) and the Pastoral Epistles (NIBC), as well as books on exegesis, hermeneutics and the Holy Spirit. These include the bestsellers How To Read the Bible for all its Worth (with Douglas K. Stuart, Zondervan); How to Read the Bible Book by Book: A Guided Tour (Zondervan). Dr Fee has made a major contribution to Academic Pentecostalism and Evangelicalism serving as Editor of the New International Commentary on the New Testament, and through his major academic commentaries and pioneering books God's Empowering Presence and Pauline Christology: An Exegetical-Theological Study. Customer Reviews For "1 and 2 Timothy, Titus (Understanding The Bible Commentary Series)"
This commentary series has a unique ability to compact a large amount of commentary in a relatively small book. This commentary by Gordon Fee, on the Pastoral Epistles, is no exception. One of the strengths of the commentary is the focus on the flow of the argument of the entire letter. He deals with individual verses but in the context of the structure and argument of the overall epistles. Fee holds to Pauline authorship and presents an "egalitarian" perspective on the controversial passages. His discussion and presentation of the opposing "complementarian" perspective is limited. The commentary is reasonably technical, with Greek words transliterated in the commentary and notes. The additional notes at the end of each section are helpful for further information on textual issues, theological controversies, etc. The commentary is primarily exegetical, so has limited discussion of application or help for the preacher. Fee bases his commentary on the NIV translation, however frequently comments where he disagrees or would suggest a different translation or emphasis. A good, readable commentary on the Pastoral Epistles. This commentary would assist any reader to develop his or her understanding of the flow and details of the epistles. Each volume in the New International Bible Commentary Series breaks down the barriers between the ancient and modern worlds so that the power and meaning of the biblical texts become transparent to contemporary readers. The contributors tackle the task of interpretation using the full range of critical methodologies and practices, yet they do so as people of faith who hold the text in the highest regard. They present a careful section-by-section exposition of the biblical books with key terms and phrases highlighted and all Hebrew and Greek transliterated. Notes at the close of each chapter provide additional textual and technical comments for those who want to dig deeper. A bibliography as well as Scripture and subject indexes are also included. Pastors, students, and Bible teachers will find in this series a commitment to accessibility without sacrificing serious scholarship. Each volume in this series breaks down the barriers between the ancient and modern worlds so that the power and meaning of the biblical texts become transparent to contemporary readers. The contributors tackle the task of interpretation using the full range of critical methodologies and practices, yet they do so as people of faith who hold the text in the highest regard. They present a careful section-by-section exposition of the biblical books with key terms and phrases highlighted and all Hebrew and Greek transliterated. Notes at the close of each chapter provide additional textual and technical comments for those who want to dig deeper. A bibliography as well as Scripture and subject indexes are also included. Pastors, students, and Bible teachers will find in this series a commitment to accessibility without sacrificing serious scholarship.